The previous year in my life saw a paradigm shift from complex circuit diagrams to high end market differentiation analysis. I thought it was time that I graduate my love from the electronic engineer perspective to a future marketer perspective. Over the years, my P&L closed with a lot of bad debts and morale share price was falling deep down. The market climate for the love I possess was seemingly cloudy till the moment I saw you. The sudden feeling that I felt was way beyond the happiness that one could get, even better than that of a brand manager who revamped the entire range of products which was about to be shelved. On seeing you, the love life cycle which I thought would be going to the obsolesce stage, suddenly picked up back to the peak. The BCG matrix has put you as a star in my heart. The intangible feeling is in the air. You comprise the maximum stake in my top-of-the-mind awareness. The way you have positioned yourself is at its best. In eve of you saying a yes to my love, I shall submit the offer document to your parent-holding for the merger of the 2 product families. If all the director board members oppose the merger, the acquisition process that I shall proceed with, shall be a hostile takeover . Lets join hands and diversify! Well, this was one movie which revolved around the hype of having 2 national award winning actors, music from the gifted Oscar and a lot of other buzz. Did it live up to the expectations? Not an utter flop. Dhanush's performance shall be remembered. Since being a half baked, I did not get the intricacies of the language that took me to like the movie during the first half and went against in the second half. The language was gauging my patience of not following the colloquial Tamil slang. 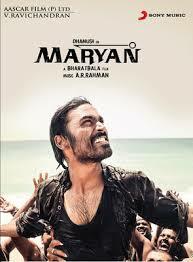 Dhanush's title role was at his best of splendor. The actor has yet again proved his mettle and talent, worthy enough for the son-in-law of the superstar himself. Supported well to add to the charm was Parvathy Menon. This actress was all around to woo Maryan in the 1st half and wail all around and portray telepathic contact with 'her' Maryan in the latter half. The support cast did their parts well especially the guys who played Sakkarai and Swami. They handled comedy effortlessly throughout. Salim Kumar was hardly seen on screen. Vinayakan, the baddie looked funnily disastrous on screen owing to his comical memories from the Malayalam movies. Dhanush's mother's sooty covered performance deserved applause despite limited screen presence. The ARR music magic was a fusion of melancholy trance and a frenzy wave of tides. Coupling with the pensive BGM, it beheld unparalleled beauty to soothe the ears. The camera captured every frame and angle with utmost precision and was a feast for the eyes. The story line had its flaws. Unbelievable at points, unimaginable at points, dumb at places. Verdict: Personal choice- A disastrous must-watch if you want to catch an eye over the acting prowess of Dhanush. It was a rickety roller coaster ride that could have been a well rounded package if the knots were braided properly. The evenings at the Institute is actually a boring affair. Bland food to the palette and a lot of assignments to bear the burden of! But, the last 3 days was all about frenzy festivities. The Great Lakers had all geared up for going in 60 hours to set up their mini ventures and mint money. More than the monetary part, it was for igniting the entrepreneurial blitz in the managers-to-be. The event 'Gone in 60 hours' was an initiative by the CIECOM (Center for Innovation and Entrepreneurship Committee) at the Great Lakes Chennai campus from the 13th to 15th of July 2013. Many budding-entrepreneurs-hidden-within came out of their comfort zones and put the hats of sales men, blaring out in their croaky/deep/chirpy/bombastic voices to woo customers to get their stuff out of the inventory. Some were seen as chefs sans the toque, some did shuttle services to get more from MORE and so on. What a scene, beautiful to behold! They had to prove their mettle and battle it out to the way to being the best entrepreneur in the campus with a span of 60 hours. The guys (and girls too) were all girding up their loins to get the things set. The CEOs-to-be were actually on the field like wayside hawkers to sell their wares to the passers-by. Lip smacking treats were prepared out of the limitation of the hostel rooms. People collaborating to get the desired end product done- some procuring raw materials, some setting the work-in-progress, some serving as ancillary suppliers, some filling in as in-bound logistics personnel etc.- a treat to watch. -and we awaited the arrival of the food with drooling mouths and high expectations. And they did keep up the expectations and went better than those we kept in stock. made it look more like a village fan fare than a college. It was fun, friends calling out to friends hoping them to shell out some money to buy and those on the other side of the counter hoping their friends to give or gift them out of their friendship. Last but not the least, all the people clearing their mailboxes over and over, archiving, transferring and deleting all over the place. The future beckons them, who were ready to help themselves!! A movie fit for being the finest. Rakesh Omprakash Mehra has done his best in the director's garb. Penned by Prasoon Joshi, the script has caught on the intricacies of the Indo-Pak relations and the problems that happened during the partition. 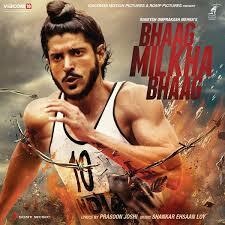 The movie has Farhan Akthar at the helm to blow life into Milkha Singh's forgotten glory. Akthar deserves applause as he portrays on screen, his career best performance. At times, Farhan seemed off note and expressionless. But taking into consideration, the acting prowess and dedication this person portrayed, it is definitely not a let down. The female lead Sonam Kapoor, who has nothing to do except smile throughout her screen presence, was a let down as compared to her previous performance in Raanjhanaa. Divya Dutta, who was seen as Isri Kaur, Milkha's sister was throughout seen with her brotherly affection. Commendable act indeed. Pawan Malhotra as coach and mentor, Gurudev Singh aided by Prakash Raj and Yograj Singh have done justice to their roles. Meaty performances by Rebecca Breeds and Meesha Shafi as Stella and Perizad respectively was good and steaming on screen but the question remains, was the obsession towards showing skin and more skin needed in depicting the life of a personality. The 187 minute run time of the movie was not quite long as it could have been. The extended duration was well justified with excellent scripting, BGM and lots of visual treats to feast the eyes on. Music by Shankar Ehsan Loy was as usual a treat for the ears. Bhaag Milkha Bhaag is definitely a must watch- keeping in mind the glorious sporting years we had. Milkha shall keep on running for the medallion that the hearts have bestowed on him already. His eyes glistened with the reflection of the eerie light on the wall. His biceps twitched at the sight of the sidekicks who blocked his way. The fiery glare out from his eyes made them tremble with fear. He took long strides to meet the evil don. Aloof about what lay ahead, bearing the guts and bravery of the iron will, he walked in the door. Facing the wall, seated on a tall leather chair was the evil don, who left the world in tears. The blood curdled screams of the lives lost battling the don filled his ears. As he was expecting, the don swiveled the chair and faced him. On his laps were his pet iguana, whose eyes resembled the blood shot merciless eyes of the don himself. The evil grin matched with the god of death himself. Now they were face to face. The good versus the bad. The hero versus the villain. As a master of Tai-pu, our man challenged the don for a bout after a swift exchange of dialogues. It was the war of the worlds. If it happened in the Vedic era, even the gods and asuras who came to see the fight would let out a shriek of agony on seeing the plight they underwent. A kick on to the groins and the don was floored. A sudden reflex and he came back on to his feet. The fighters were moving from the don's boardroom and the 101st floor atrium balcony of the Imperial Towers in Kazhakootam was witnessing a terrible fight. He, the master of Tai-pu, took out his signature move and again the don fell to his feet. Hoisted by his hands, the don pushed up and delivered a nasty ghastly blow on to his opponent's chest. He fell off balance and was dangling down the balcony. With a grim smile, the don lifted his leg to stamp on his fingers that suspended the whole of his body. A momentary flash later, he heaved up to catch hold of the don's leg and at the same time, the stamp came to his other hand. And there they were falling off the heights of the tower. Chances of survival- absolute zero. A resounding thud and he opened his eyes. The back of his head was throbbing with pain. He sat up on the floor of his hostel dorm, rubbing his head. He sat there with a smile. The superstar had just woken up from his yet another super hero dream! To many of those Jr. NTR movies, I suppose. The don was lying on the opposite bed, saliva drooling out on to form a dried-up puddle mark on his bed sheet. And he was sleeping peacefully. The iguana shaped pen holder was smiling at him from the 'don's bedside table. It is too much to expect good food from the college lunch room. But at times, is it wrong to crave for some stimulation of the taste bud? Alas, it happens rarely. It happens when you pay for food at the temple town and pay for the commute through your nose, leaving the wallet weigh a kilogram lesser. Else it happens only when there is some special occasion. But at times, the rush in the lunchroom makes you think is it a special occasion. Well, yeah, its SPARTA when it comes to getting that hot aloo paratha off the platter or laying the hands on the tender jucy gulab jamuns (how I wish it was!) The hazelnut colored succulent spherical balls doused in the golden hued sugary syrup leaves me all drooling, not any more. How contradictory it is on my part to describe the not-so-good-Manamai-made-Indian dumpling as a succulent tasty one! The wafting smell of the not-so-good curries would actually try making you salivate, mostly in vain. It would be a rebellious affair to get yourself a plate and spoon. Once you lay hands on them, the wait is real tiring to load the plate and hunting for a place with your fully loaded tray of 'goodies' is really painstaking. The food, mind you, is worth mentioning. The paneer is made as if it was to be given for charity. Bland blood-color tinged watery gravy with rock solid paneer- ultimate! The color of the daal looks tempting but as it makes contact with the tongue, you know what. Watery, gross tasting. Obviously it is food colors galore that gave a sensory misappropriation. The rice would be as cold as the expression of the staff there. The grains stick on to each other in such unison and the ladle would come up a slice of rice cake. The sweet is often very sweet with no special flavor apart from the sugar that predominates the taste. Boiled concoction of milk and sugar becomes the payasam (kheer) and an overdose of jaggery over rice is our sweet pongal. Curd, that is made in-house deserves no special mention. Sour or with that prickly tinge, it degenerates the taste buds and makes them capable of doing nothing during your meal, except curse the cook. The menu is often set by experiment-savvy gentlemen who prefer eating paneer-do-pyaas with dosa and hakka noodles with coconut chutney. Lastly, we are often denied the ambrosia if we miss the clock by a second. Sadly, the day the taste doesn't linger on the lip puts the day to haywire. Reading the menu to picture the whims and fancies of the ornate delicacies that adorn the table can give rise to a hysterical laugh riot. All those who have abused your mom for not making good food, please do a 'PADAPOOJA' and seek mercy at her feet. We got what we deserved!